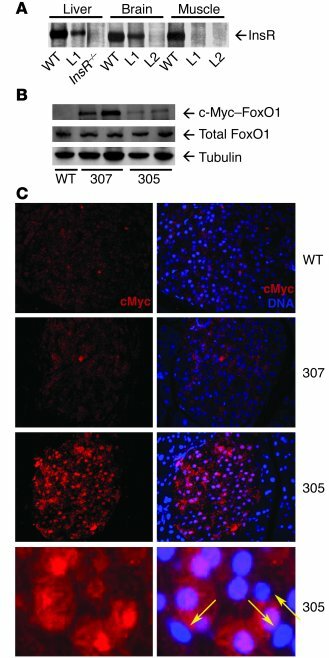 Detection of c-Myc–FoxO1 fusion proteins. (A) Insr Western blot. We detected Insr by Western blotting of liver, brain, and muscle extracts of WT mice. L1 mice express Insr in liver and brain, but not muscle. Insr–/– mice do not express Insr in liver while L2 mice are Insr transgenic knockouts with Insr expression limited to liver and β cells (26). (B) FoxO1 Western blot. We performed immunoprecipitations with anti–c-Myc antiserum and Western blotting with anti-FoxO1 antiserum (upper panel). As a control, we show immunoblotting with anti-FoxO1 (middle panel) and antitubulin antisera (lower panel). (C) Pancreatic immunohistochemistry. We performed immunostaining of pancreatic sections from WT, 307, and 305 mice with anti–c-Myc antiserum to detect transgene-encoded FoxO1 (left panels, red). DNA counterstaining with DAPI is shown in right panels. We show representative sections to illustrate the difference between transgene-positive and transgene-negative cells, indicated by the yellow arrows. Magnification, ×40 (top 3 rows); ×100 (bottom row).